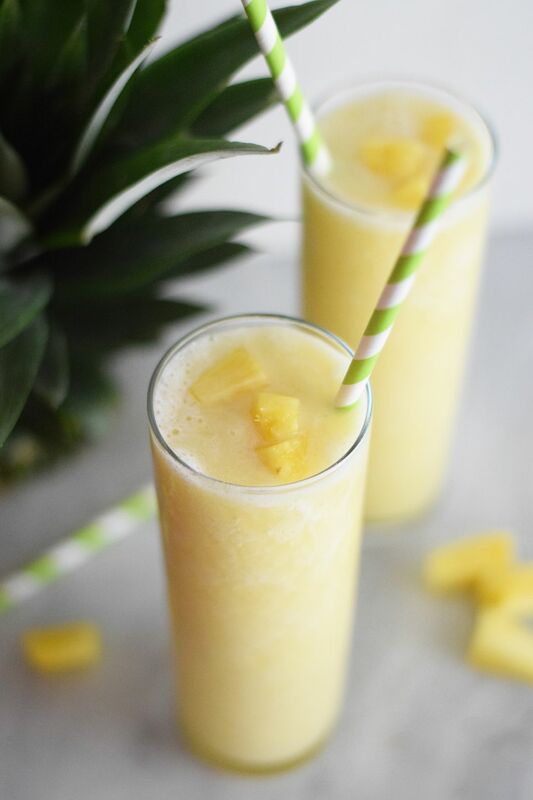 Pineapple smoothies are fresh and refreshing any time of year, but especially in the hot summer months. This super simple recipe is bursting with flavor from the tropical fruit. Banana adds a little sweetness without taking away from the pineapple. If you want to mix things up, however, try these two equally refreshing variations: Raspberry Pineapple Smoothie or Pineapple and Coconut Smoothie. This smoothie calls for fresh fruit, but you can easily freeze the fruit ahead of time or use pre-cut frozen cubes as a shortcut. If you do, just omit the ice when it comes time to blend. You might also need to adjust the amount of liquid, so add a little at a time while blending if you do go this route. The limeade adds a nice zesty kick that really accentuates the pineapple flavor, but you can make it taste even more pineapple-y by adding pineapple juice and a tablespoon of lime juice instead. You can also substitute in low-fat coconut milk if you're looking to cut back on the sugar content or add an extra touch of tropical creaminess. While this smoothie is very low in calories, it does not have any protein to help keep you full. If you want to bulk up the drink, simply add some non-fat vanilla or plain Greek yogurt to the mix. To keep the smoothie at the same smooth consistency, drop in about a 1/3 cup of yogurt and reduce whatever liquid you're using by half. Pineapple itself isn't just delicious, it's also good for you—the fruit is low in calories and packed with nutrients like vitamin c, antioxidants, and manganese. Pineapple can also help with digestion since it contains a digestive enzyme called bromelain that helps break down protein molecules. It can even help your immune system and suppress inflammation. There's no better way to reap all of the health benefits of pineapple than by enjoying the fruit in a delicious and easy smoothie. Peel, core, and cut the fresh pineapple. Make sure to chop the pineapple into smaller chunks before adding it to the blender. Choose a banana that is ripe, but not browning. Break it up into about four pieces. Place the ice, pineapple chunks, banana pieces, and limeade in a high powered blender that can handle crushing frozen ingredients. Pulse and crush until it is completely blended and very smooth. If it is too thick, slowly add more limeade or juice until it's at your desired consistency. Pour the smoothie into tall glasses and garnish with sliced pineapple and a cute straw.